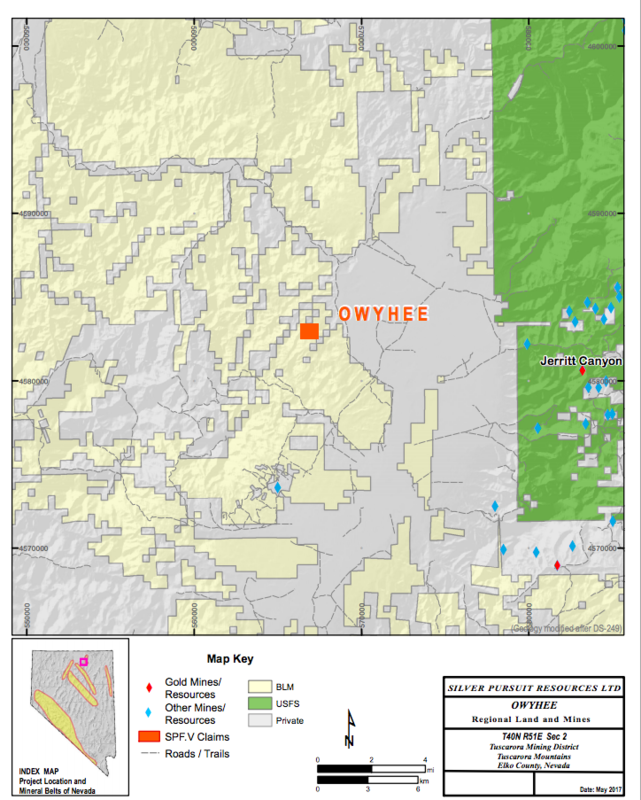 The project is situated on the east flank of the Tuscarora Mountains and along the western margin of the Independence Valley in northern Elko County. 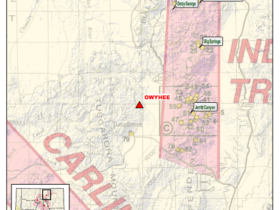 The Owyhee claims are located eleven miles west of the Jerritt Canyon District and six miles north of Tuscarora. Elevations range from 6000 to 6600 feet (1928-2011 m). Epithermal precious metals as stockworks and high-grade vein zones hosted in Tertiary volcanic rocks and associated with Tertiary intrusive rocks. Exploration work completed in 1980, by the Cordex Syndicate, included detailed geologic mapping, rock chip sampling, dozer trenching and rotary drilling. Original assay results carried up to 0.298opt (10.2 g/t) gold in material associated with past production from an antimony prospect. Thirteen backhoe trenches explored the mineral potential near the original sample and eleven of the trenches carried at least trace values of gold. The best results from the trench sampling is 28 ft with an average grade of 0.062 opt (2.1g/t) gold. The project was drill-tested by four, widely -spaced, rotary drill holes (995 feet total) with low gold values in one hole from 20-65 feet of depth. The target of lower-plate rocks was not encountered in drilling and the project was dropped. Further exploration activity was carried on by Ventura Gold Corp, in a joint venture with Zappa Resources in the mid-2000’s. Press releases, from 2005, describe the project as a” low-sulfidation, volcanic-hosted, epithermal system” with extensive argillic alteration and local zones of silicification. Surface samples, mostly from quartz veins and fractured volcanic rocks, contain precious metals that ranged from nil to 10.2 g/t Au and up to 525 g/t Ag. Trace element geochemistry from soils and rock are reportedly anomalous in arsenic, antimony and mercury. This suite of elements is characteristically associated with high-level mineralization in the epithermal environment. Patterns of trace element distributions may be useful to provide vectors to high-grade precious metals in the hydrothermal system. In 2006, Ventura conducted a ten-hole, core-drilling program (~2236m total) to test geochemical and geophysical anomalies at the project. Initially, drilling assay results were reported in spring, 2007 with mixed results. A press release in August 2007, however, indicated that assays failed to check as expected. No further exploration activities were conducted by Ventura and the claims were dropped at the project in 2010. The geology of the Tuscarora Mountains is made up of Eocene volcanic rocks with windows of Ordovician strata exposed along structural highs in the range. 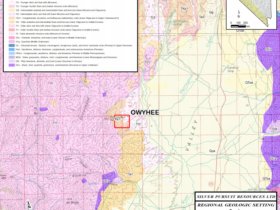 Details of the volcanic rocks has been described by NBMG personnel in the course of mapping the Tuscarora quadrangle (adjacent quad to the south of the Owyhee project). The oldest map unit at the property is the Ordovician Valmy Formation. The unit is made up of cherts, quartzite and limestone interbeds. It is thought that the rocks are exposed in the range along structural highs developed by pre-Tertiary deformation. 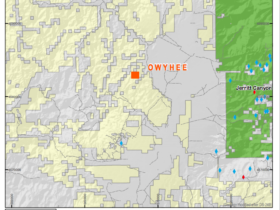 The Tertiary volcanic rocks at Owyhee claims are correlated to the Eocene age rocks in Tuscarora quad. The oldest Tertiary map unit is a volcanic breccia with dacitic matrix and locally includes fragments of Valmy Formation lithologies. The volcanic breccia is overlain by a map unit that includes a variety of lithologies including a useful marker bed of porcellanous tuff. Other lithologies in the map unit include crystal tuff, welded tuff, lithic tuff and granular tuff. Volcaniclastic beds are interfingered with the tuffs. Above an angular unconformity at the top of the tuffs, are rhyolite breccias, with inclusions of Valmy lithologies. The rhyolite breccias appear to have a time-equivalent rhyolite that occurs as small intrusive bodies. The rhyolites are overlain by dacite flows and are cut by dacite porphyries. The uppermost Tertiary rocks at the project are andesite and basalt flows that are areally extensive in the range. Post-Eocene rocks include older alluvial fan deposits, landslides, debris flows and recent alluvial deposits. A broad zone of argillic alteration with a northwest trend extends over 4000 feet in strike-length at the claims. (Cordex report, 1980). The best gold values are from samples of fragmental volcanic rocks. Silicification, proximal to rhyolite dikes, is locally associated with gold mineralization. 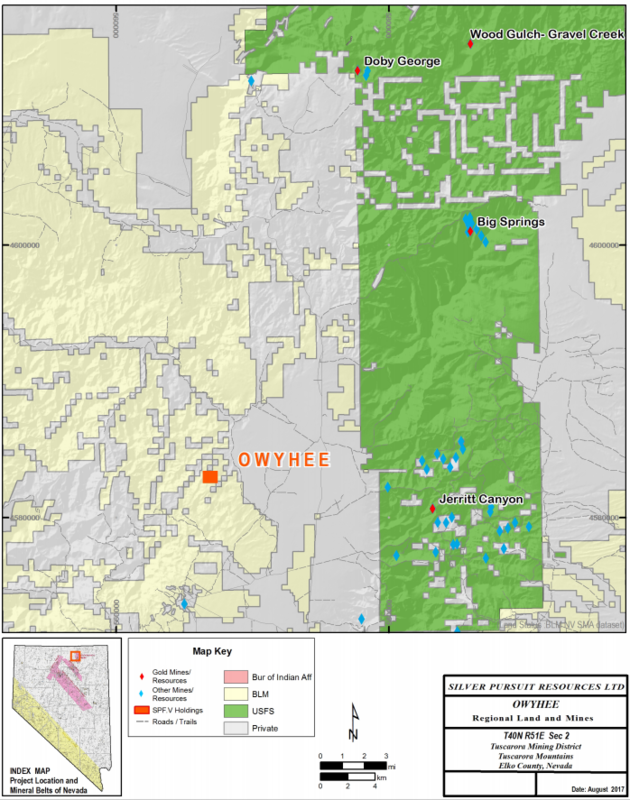 The trace element association of Sb, As and Hg with gold and silver mineralization at the Owyhee Project is characteristic of high-level, epithermal mineralization. Cordex reported that the antimony shows a strong correlation to gold. One, five-foot drill sample carried 0.22% Sb in the highest gold interval assayed. Specks of realgar are also present as disseminations but the correlation of arsenic with gold is more erratic than antimony. 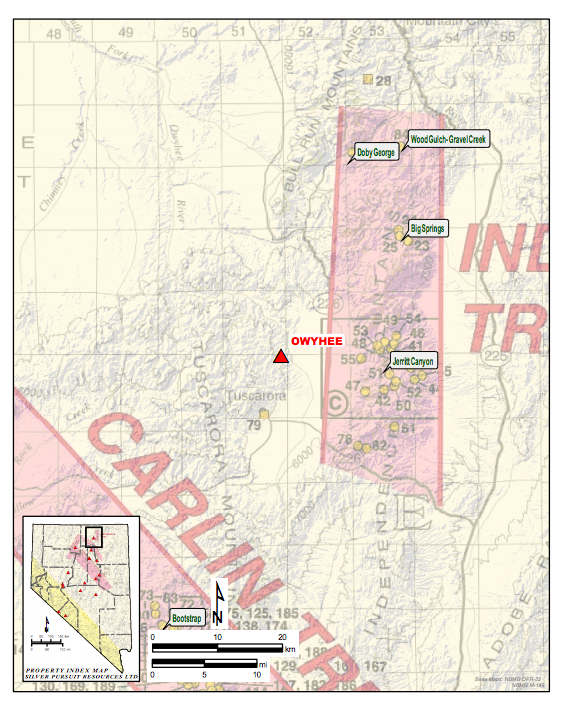 Gold and antimony are associated in the Jerritt Canyon district, eleven miles east of the project. Host rocks at Jerritt Canyon are Paleozoic sedimentary rocks. 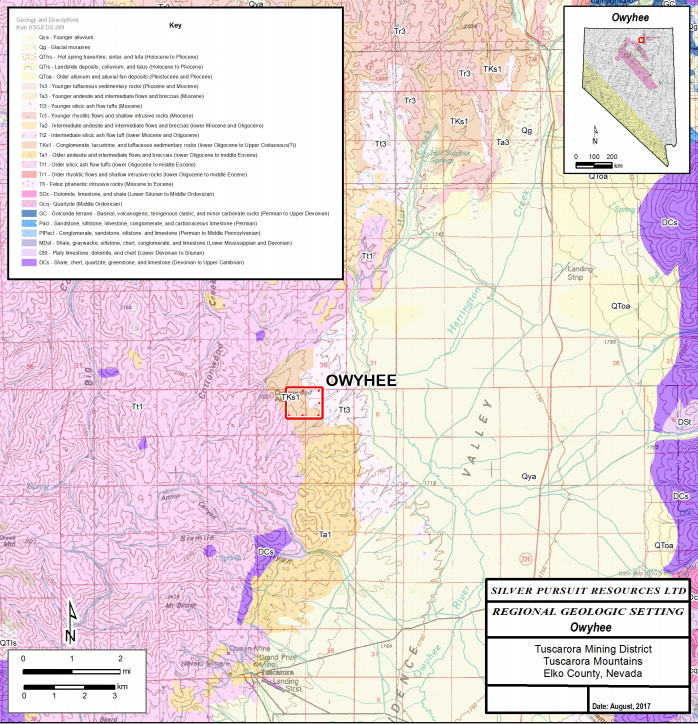 Six miles south of the Owyhee claims is the Dexter mine in the Tuscarora mining district. Mineralization at Dexter is hosted in the Tertiary volcanic rocks and associated with adularization of bedded tuffs and thin, closely-spaced quartz and adularia veins. 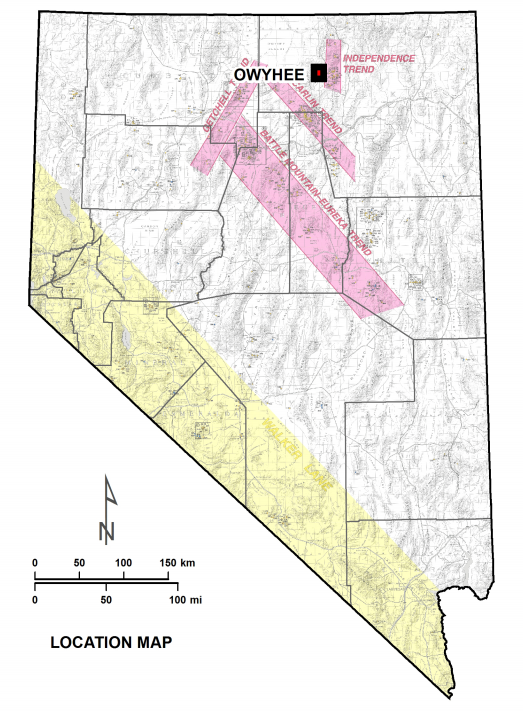 Veins and veinlets form stockworks along structural zones between andesite and tuffs (Elko County Report). 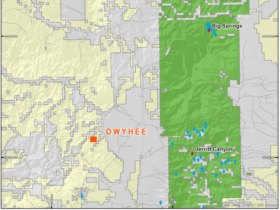 The style of mineralization at Dexter is thought to have similarities to the mineralization identified at the Owyhee claims. Sampling, mapping and reconnaissance is proposed to explore the potential of gold mineralization associated with the broad zone of argillic alteration near the original antimony prospect and in association with the intrusive rocks where silicification is evident. Ground-based geophysics may be conducted to identify the signature of the altered zones associated with precious metals mineralization. Thank you for subscribing to Silver Pursuit Resources! Stay tuned for upcoming updates!.